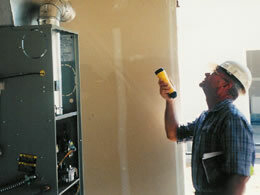 The mission of the Building Department is to protect the health, safety and welfare of the public by assuring that all buildings, structures and related equipment are constructed, installed and maintained in compliance with the standards contained within the Virginia Uniform Statewide Building Code. The Commonwealth of Virginia has adopted a new building code which became effective on September 4, 2018. Approximately every three years this process occurs through the legislative process. This is not intended to be a comprehensive list of all required inspections. For an official inquiry, please contact the Building Inspections department directly. All footings are inspected after excavation and before pouring concrete. All slabs are inspected prior to pouring concrete with all steel in place. Concrete walls are inspected prior to pouring concrete with all steel in place. Backfill/foundation drainage inspection prior to burying habitable basements and crawl spaces. All plumbing and gas piping and electrical conduit or wiring prior to covering ditch. All gas lines, fuel lines, water and sewer lines must be pressure tested. Rough-in inspections of plumbing, electrical, HVAC, and gas prior to concealment. Framing inspection of floors, walls, and roofs prior to insulating. Insulation inspection prior to hanging drywall. Fireplace hearth inspection prior to pouring concrete with all steel in place. Inspection required on all electrical services prior to connection by power company. Electrical bonding and steel placement inspection for all pools. Special inspections as required by the building code or inspector. Final inspection is required on all projects.